A lot of writers post pictures of their book “in the wild.” Usually it’s a shot of the book on a store shelf, or of a disembodied hand holding the book in front of a landmark building, or propped next to an espresso and tiramisu on a trendy café table. 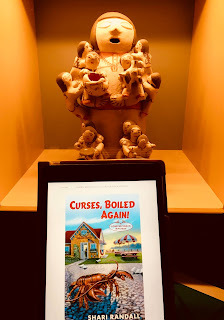 Just last week, author friend Carol Potenza sent me a pic of Curses, Boiled Again with a storyteller doll at a museum in New Mexico. Some days my book has more fun than I do! I plan to return the favor when – if! – the weather ever improves here. Snowy, gray New England in mud time doesn’t make the most enticing background. Speaking of not very enticing backgrounds, I did take a photo of a friend’s book in the wild last week under unusual circumstances. Well, sadly, not entirely unusual, just not the typical book in the wild shot. Last week, my husband had back surgery. I found myself doing a lot of waiting at the hospital - a lot of waiting: in the Family Lounge where we all tried to avoid each other’s eyes; in the Quiet Lounge where I managed, just barely, to restrain myself from killing a man who insisted on taking a phone call; in the hospital cafeteria; at my husband’s bedside, as he rested between visits from RNs, PAs, physical therapists, and residents. I tried to distract myself with television and Facebook, but all they did was keep me tethered to the present, to reality, to, as Ephron said, the “all too real.” I needed something to truly, in the way of the old Calgon commercial, take me away. My friend Dianne Freeman had sent me an ARC of her Downton-esque debut, A Lady’s Guide to Etiquette and Murder. As my husband dozed and medical equipment beeped, I sank into the tale of Frances Wynn, the American-born Countess of Harleigh, who must simultaneously solve the mystery of her philandering husband’s death, get to the bottom of burglaries plaguing London’s elite, and find a suitable suitor for her sister, Lily. It was light and witty - a great escape. I was glad when it was time for Bill to come home, but sad to leave behind 1899 London. Now that Bill’s home and back on his feet, I can put my feet up and sink back into Lady Frances’ world. Thanks, Dianne! Is there a book that helped you escape when you really needed it? Please share in the comments. Shari Randall is the author of the Lobster Shack Mystery series from St. Martin's Press. Book Two, Against the Claw, is available for preorder now. I’m forever with my nose in a book to prevent the real world from intruding. My latest fine read was fellow WWK member Tina Whittle’s Necessary Ends. My current book stack includes Charles Todd's The Gate Keeper, Burke's The Wife, and Donna Leon's The Temptation of Forgiveness. I'm reading them all at once. And I'm prepping for my book club discussion of Lehane's Mystic River. Jim, so many WWK books I want to get to - including yours and Tina's! Margaret - I'll be interested to hear what you and your book club think of Mystic River. I think it's a great book. I always think books are superior to their movie versions, but in this case,I think the movie was equal to the source material. Louise Penny. After my dad died and I could hardly concentrate on anything, I found I could lose myself in Three Pines and the world of Armand Gamache. I will always be grateful to Louise for that. And now I'm off to look up Dianne Freeman's book. Thanks for the tip, Shari. There's nothing like losing yourself in a book! I'm so glad A Lady's Guide was able to provide an escape for you, Shari. And I'm really happy your husband is back on his feet! Must be your expert nursing! When recovering from bone marrow transplants book were my bridges back into the world. I started with short stories since I could not concentrate long enough to read a book, then to children's books before novels. I got the flu one time and had to stay in bed. I started reading The Cat Who series. I was hooked. They took me out of my misery. So much so, I went to the library and checked out the rest of the series, came home, went back to bed and read the rest. I probably could have gotten back to work prior to those last few days, but instead of forced sickness--it became vacation time. Yahoo! Hi Barb, Louise's books are just wonderful to sink into - how I wish I could live in Three Pines! Hi Warren - books are also bridges - yes. And how interesting that children's books were in the mix for you. I think they have special powers not found in other books. Hi EB - I know what you mean about the Cat Who - I love them! My go-to book is Rafe by Weldon Hill. The main protagonist is Rafe, an adolescent boy who can never quite live up to the expectations of his disabled father, especially when compared to his older brother. It's full of well-intentioned, troubled people (with only one unlikable character) who create problems for themselves and others due to circumstances and poor decisions. It always ends the same way--a very satisfying happily-ever-after solution. Haha! I recognize the storyteller doll photo! I had such fun with the 'Out in the Wild' assignment, I won't stop! And I really enjoyed your book, Shari. Hope we get to meet someday.